It is incorrect to say that aluminum can be turned into chrome, or vice versa. Both are elementary metals found on the periodic table. As such, one cannot be changed into another. This concept is known as alchemy and was disproved several hundred years ago. It is, however, possible to process aluminum in such a fashion so as to make it indistinguishable from chrome. This is most commonly done on motorcycles as a cheaper alternative to purchasing chrome accessories. 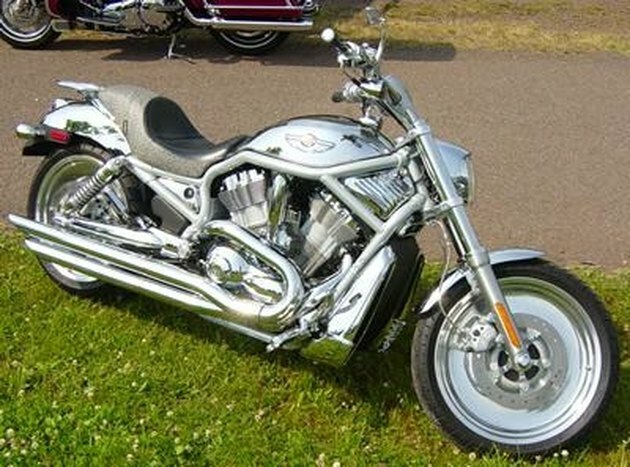 For the sake of this article, we will explain how to make aluminum mimic chrome as it pertains to motorcycles. However, this process is identical regardless what the aluminum object is. If you've got the time and patience, you can do this to faucets and showerheads, for example. Chrome accessories can be expensive, but with a little work, you can modify your aluminum parts to look like chrome. Disassemble all the parts of the motorcycle you intend to give a chrome finish, such as the highway pegs, sidebars, exhaust pipes and wheel caps. 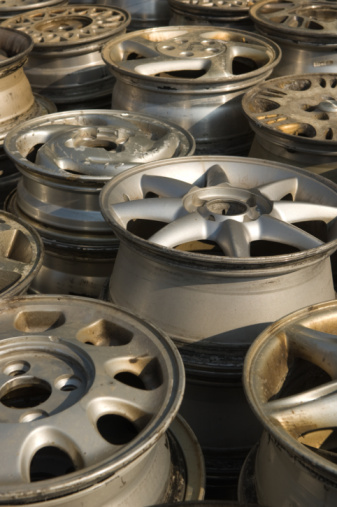 Lay out the metal parts and wash them with clean water and a towel to remove any grime or dust. You need many towels as you do not want to use a towel that has been used to remove dirt or sandpaper grit on a clean part. Don’t worry about drying the parts, this is a wet process. Pour a few dabs of car soap on your 220 grit sandpaper and dunk it in a bowl of water. Give your aluminum parts a thorough rub down. Keep the sandpaper and the aluminum parts lubricated with plenty of water. Depending on how many parts you are finishing this can take you anywhere between 20 minutes and 1 hour. Do not use circular motions as it leaves swirl patterns in the metal. Instead, rub the paper back and forth, all in one specific direction. Rinse the metal parts down thoroughly and get a fresh bowl of water. Pour a few dabs of car soap on the 400 grit sandpaper and wet it thoroughly. Repeat the rub down process, but this time work the paper in a back and forth direction perpendicular to the first. Continue to rinse and rub the parts, gradually going all the way to the 2,000 grit sandpaper. By this time the surface of the parts should be smooth as glass and possess none of the gleaming factory finish they started with. Use more clean towels to completely dry every inch of the aluminum parts. Leave them out in the sun to dry if you have to. Fit your Powerball mini polisher into your variable speed drill and saturate the head with aluminum polish. Polish the metal parts just as thoroughly as you did the sanding. Leave the polish to set for a few minutes before using your polishing cloths to buff the surfaces. At this point your aluminum should be a dead ringer for chrome. Preserve all your hard work with a high quality aluminum sealant, as unfinished aluminum has a tendency to develop a scaly corrosion. Yes, this means more polishing. Reaffix the parts back onto your motorcycle, once the sealant has dried.